Republican Senators Bob Corker (TN), John Thune (SD) and Orrin Hatch (UT) are openly discussing the possibility of supporting the tax increase as a way to find funds for highway infrastructure projects. Even the usually reliable conservative Senator James Inhofe (R-OK) is considering the tax plan. 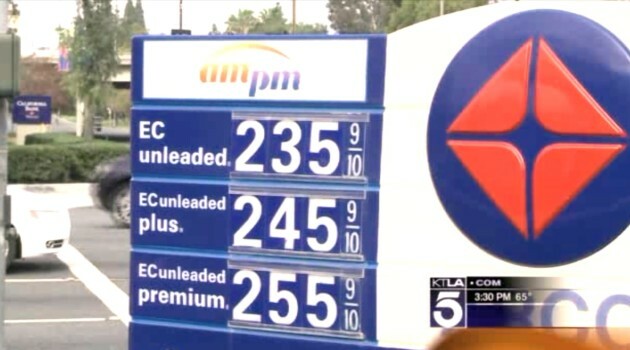 Echoing House Minority Leader Nancy Pelosi (D-CA) in calling for a gasoline tax increase from its current level of 18.4 cents is certainly not the way to brand the new Republican-led Congress. At the heart of the new tax is the need to find a funding mechanism to pay for the Highway Trust Fund that is running out of money largely due to the loss of gas tax revenue from Americans driving more fuel efficient cars. Senators Corker and Chris Murphy (D-CT) have introduced legislation that would raise the federal gasoline tax by 12 cents over two years and index the tax to inflation to generate future revenue. The big business lobby driven by the U.S. Chamber of Commerce is steering the call for the added gasoline tax. The trade group, which is frequently mischaracterized as politically conservative, is a huge fan of laundering taxpayer money through the government to its big business members. The Chamber spent a significant amount of money during the last election cycle to make sure that Tea Party backed candidates that reject corporatism were defeated. Now the Chamber is looking to cash in on its investment. Republicans must recognize the Chamber is focused on pleasing its members and not the future of the GOP. The mere suggestion of a tax increase with Republican fingerprints on it is a mammoth blunder of policy and politics. Adding a gasoline tax as a product from the Republican Congress would damage the party’s brand just when the public is viewing it more positively. After Republicans scored a sweeping victory in the midterm elections, in large part due to the impact of a slow economy and stagnant incomes on the middle class, members of the new Senate majority are considering raising taxes that would harm this important voting bloc. The precipitous drop in gasoline prices since last June, has served as a huge tax cut for the middle class helping offset their stale wages. The numbers are staggering. Goldman’s report issued in December estimated that a drop in gasoline prices could translate to $125 billion tax cut in 2015. Increasing the gasoline tax would reduce the economic benefit that’s now being enjoyed by millions of middle class families. Most importantly, with control of Congress, Republicans have an opportunity to show that less government and lower taxes are the path to prosperity, and that these policies can revitalize the middle class. The problem with Washington is spending not revenue. What’s needed is a uniform Republican message on energy policy that is absolutely void of tax increases and unnecessary regulation. The idea of raising the gasoline tax exposes everything that’s wrong with the D.C. insiders and makes rejecting this initiative critically important. It’s up to grassroots activists to make sure Republicans become the party of growth and opportunity and let the Democrats be the party of taxes and corporatism.